The driver, Shashank Chauhan, (20), has been booked by the Ulsoor traffic police for driving under the influence of alcohol and causing the death of Devanshi Rajaguru. 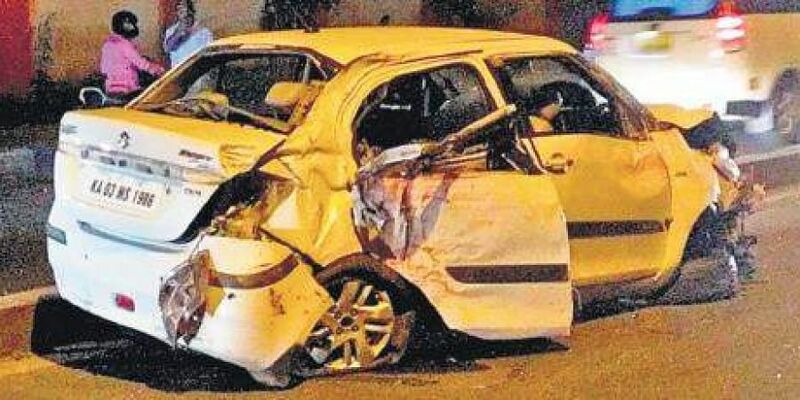 BENGALURU: A 21-year-old interior designing student was killed on the spot while four others were injured when their car rammed into the compound wall of the Army quarters on Old Airport Road in the early hours of Saturday. The driver, Shashank Chauhan, (20), has been booked by the Ulsoor traffic police for driving under the influence of alcohol and causing the death of Devanshi Rajaguru. The injured are Bhumika Devanshi, (20), a teacher at a kindergarten school and Raghunandan, (21), Adithya Adiga, (20), and Amisha Patel,(21), all students of a private college in south Bengaluru. The condition of Shashank is said to be critical. The police said that the injured told them that they had come to Indiranagar for a party and were returning when the accident occurred. Shashank, who was driving the car (Swift Dzire), lost control of it and jumped the median and crashed into the compound wall located on the other side of the road. The car toppled owing to the impact of the crash. Passersby took the injured to a private hospital where Devanshi was declared brought dead. Raghunandan told the police that Devanshi and her sister Bhumika had come to Bengaluru last week from their native Rajkot in Gujarat to meet their friend Amisha. The sisters stayed at a lodge in Koramangala. Amisha had introduced the sisters to Shashank and then they all decided to go for a party on Friday. While the three girls reached the pub in a cab, Shashank, along with his friends Raghunandan and Adithya, drove down in his car. At around 1.15 am, the sisters asked Shashank to drop them to their lodge in Koramangala. While the three girls were seated behind, Raghunandan and Adithya were sitting in the front. Doctors confirmed that Shashank was under the influence of alcohol. The car belongs to Shashank’s mother. Anto Prashanth, an eyewitness, said that he was cycling towards his house in Domlur when the overspeeding car jumped the median and hit the wall. Meanwhile, the victim’s father Bhaskar Rajaguru, a businessman, rushed to the city from Gujarat. This is the second case of drunk driving reported in Ulsoor Traffic Police Station limits in as many months. In August, a 15-year-old was mowed down by a car driven by a doctor near Domlur Flyover.